Can I just say, this book caused a lot of happy squealing on my end? First when Preston personally (!) sent me an Advanced Reader Copy (!!) Then when I saw the first page of the book, and again when I finished it. 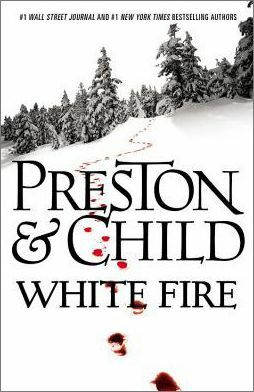 I have been a huge fan of Preston and Child’s Special Agent Pendergast for about 10 years now. Having finished their latest sub-trilogy in the series, they decided to explore new ground with Pendergast. And by new ground, I mean going way back in the past to the ground at the root of all detective stories: Sherlock Holmes. I have long held that Pendegast is the most Sherlockian of detectives currently being written. So one of my squeals came when I opened White Fire to see a note that the character of Sherlock Holmes was used in this novel by permission of the Conan Doyle estate! Of course, how one of the greatest detectives in fiction got mixed up with Sherlock Holmes is a (typically, delightfully) twisted story. Special Agent Pendergast’s protege, Corrie Swanson, is looking for the perfect research project to advance her studies at the College of Criminal Justice. She stumbles upon accounts of a man-eating bear in a Colorado mining town in the 1870s. Corri pours all of her resources into research, but powerful families in the town (now a high-class ski resort) are uncomfortable with what she unearths. While she digs around in the past, houses in the town are being burned to the ground. Corri makes some impetuous descisions, and this is where Pendergast has to come riding in to bail her out. If you had merely said to me the words “Pendergast and Holmes” I would’ve been excited. Happily, this book was everything I hoped it would be- and more. Lincoln and Child do not disappoint. Fans of Pendergast will be happy to encounter him in this unique adventure. Readers new to the series will find this book an excellent place to start. The other top (altho not quite as good) Sherlockian detectives currently being written are J. Deaver’s Lincoln Rhyme and J. Nesbo’s Harry Hole. This entry was posted in Fiction, Top 10 and tagged book review, mystery, Sherlock Holmes. Bookmark the permalink.